FreshMarine.com - The Eastern Box Turtle - Terrapene carolina - Buy Eastern Turtle Now and Save! 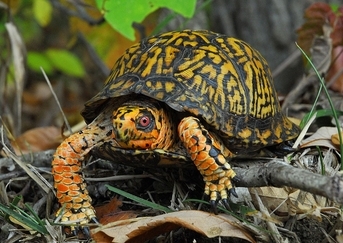 The Eastern Box Turtle or Terrapene Carolina Carolina is a sub species that belongs to a larger group named Box Turtles. Their hinged shell puts them under this category. They belong to eastern part of United States. It is the only land turtle which is found in North Carolina. They are both slow crawlers and slow to mature but they live extremely long, mostly up to 100 years. The high doomed carapace and hinged plastron allows them a total shell closure which thus gives them protection when in danger. Their shell, if damaged or injured has a capacity of regenerating and reforming. Carapace is usually black or brown in color which is complemented by yellowish or orangish radiating arrangements of lines, spots or blotches. Males, in some populations, have blue patches on their cheeks, throat and front legs. The color of eyes of males and females also differ. Males possess red eyes whereas females display brown eyes. Males� plastron is concave in shape whereas females possess a flat plastron and this helps the males fit over the back end of female�s carapace during copulating. The mating season of Terrapene Carolina Carolina starts in spring and continues till October. Males mate with more females in several years. Fertile eggs are not easily laid by females. It may take up to 4 years after one successful mating. Nests are dug in sand or soil using hind legs. Sharp, horned beak, stout limbs and webbed feet only at the base are Eastern Box Turtle distinctive features. They do not grow over 6 inches. They make their dwelling mostly near the edge of forests. Open meadows, under shrubs and fallen logs are also the places they can be frequently found. They rest on moist leaf litter. For their natural habitat either a large indoor terrarium or an outdoor enclosure with agreeable climate is perfect. Terrarium�s temperature should be between 75-85 degree Fahrenheit and humidity level should vary from 60-80%. Soaking themselves in shallow water is also part of their routine so their enclosure should have a shallow pan of waters all times. UVB emitting reptile light, hiding spot and basking spot with temperatures 85-88 Fahrenheit is also required. When kept in outdoor enclosure make sure both sunny and shaded areas are provided. Terrapene Carolina Carolina is omnivorous and eats from a variety of snails, insects, worms to fungi, berries, roots, flowers, fish etc. In wild they can also feed upon dead ducks, amphibians, small mammals and dead cow too. Young tend to be carnivorous whereas adults turn into herbivorous but green leaves should not be added in their diet. In captivity they should be provided with mixed berries, fruits, mushrooms and clover. Moist dog food can also be offered occasionally. Vitamin and calcium supplements can also be sprinkled on their food which will be required for the shell growth and strength. These turtles should not be consumed as they consume poisonous mushrooms at times and can be dangerous to eat.